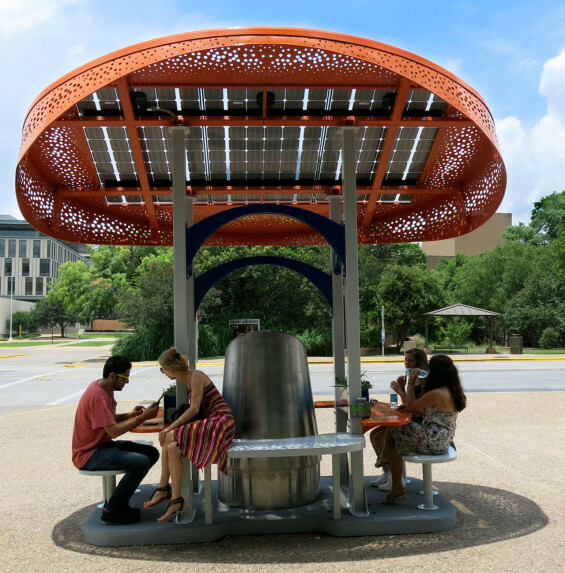 The University of Texas at Austin’s Campus Solar Charging Station project is an innovative combination of renewable energy education, place making and cutting-edge solar technology. 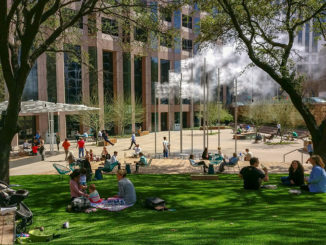 The station offers students and community members the opportunity to gather in the shade while recharging their laptops, phones, e-bikes and electrical devices via USB ports or standard electrical outlets. With three solar panels, the station provides a WiFi workstation and solar laboratory for students during the day. Six batteries extend the charging capacity on cloudy days and into the night with vibrant LED lighting. On average, each charging station produces 1.7 kWh per day or 620.5 kWh per year, which is the equivalent of 949 lbs. of CO2 avoided per year (source: OpticsRE and EPA). Soon the station will have a mobile app to digitally display total energy production, use and equivalent CO2 reduction using real time data from the stations themselves. 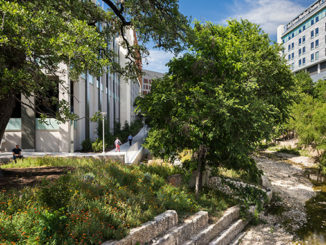 This project was been funded by The University of Texas at Austin’s Green Fee program managed by the Office of Sustainability. 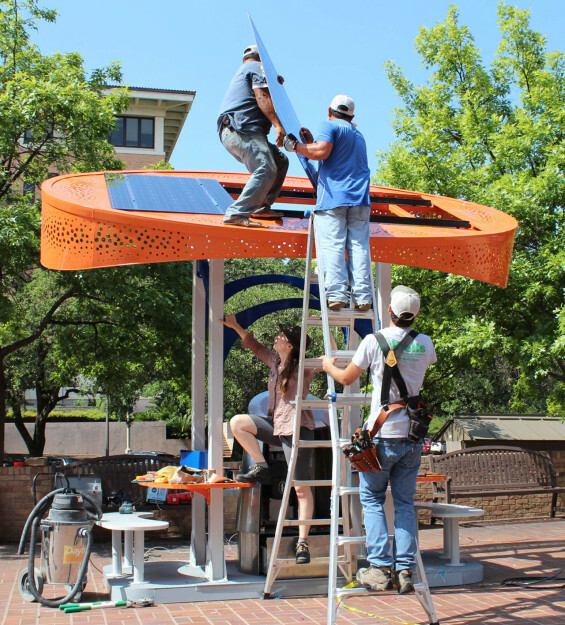 The stations were installed at the Perry-Castaneda Library Plaza and in front of the Art and Art History building in June 2014. 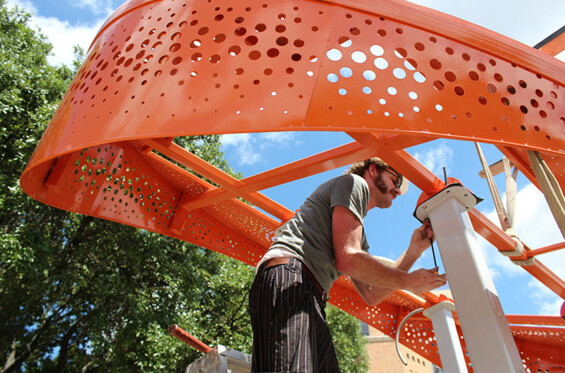 The project was designed by Beth Ferguson and Dallas Swindle of Sol Design Lab and was fabricated at The Department of Art and Art History’s sculpture studio with the help of fabricator Rick Mansfield. 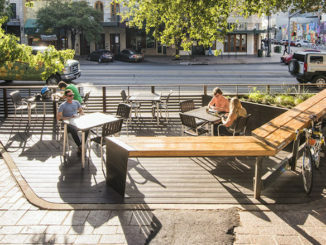 The goal of Sol Design Lab’s work is to spark conversations about energy use, resiliency, evolving use of public space and innovation for our changing world. 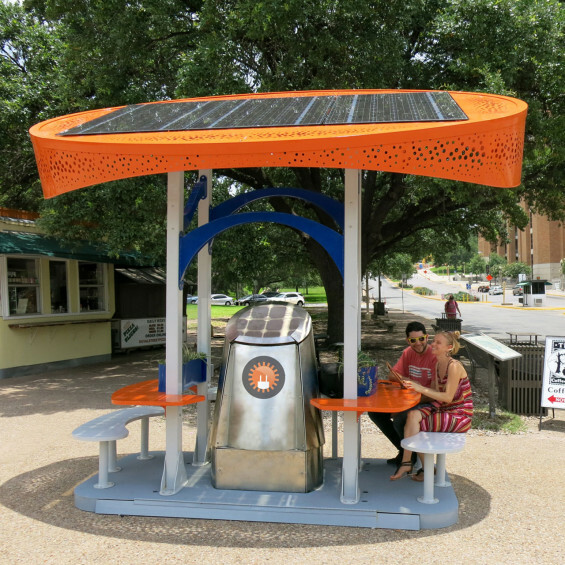 Sol Design Lab has designed and prototyped solar-powered charging stations for electric scooter and mobile electronics for use at festivals like SXSW, business districts, campuses, and city transportation networks. 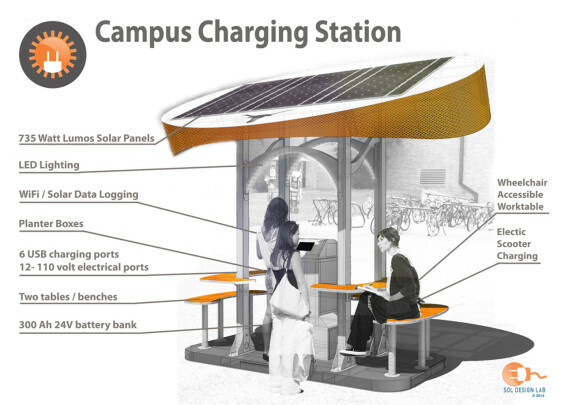 These eye-catching and educational charging stations create vital infrastructure for the integration of electric scooters and renewable energy into urban streets and schools. The solar station gives the community an opportunity to engage with campus sustainability projects and learned about solar energy first hand. Design | Beth Ferguson and Dallas Swindle of Sol Design Lab.